With this, easily among themost sought-after 45s on Twinight, Gary, Indiana’s own Nate “Tobacco Road” Evans turned in a stunning 1972 double-sider. The single is best regarded for "Main Squeeze," a triumphant mid-tempo number with uplifting horn stabs penned by Earl Randle prior to his work at Hi in Memphis. 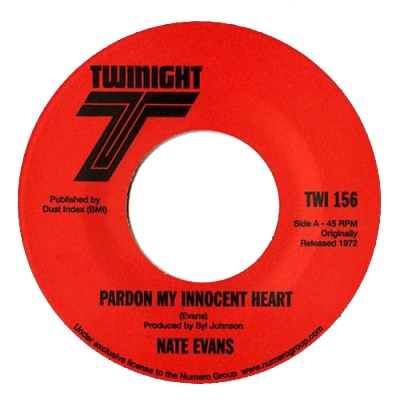 But it's Evans’ original work, “Pardon My Innocent Heart,” that's the real bottle-breaker. Dark and brooding, with backing by the Kitty Haywood singers, it's a perfect cap to Twinight's impressive five-year, 56-release gallop through the Chicago night. Easily among the most sought-after 45s on Twinight, Gary, Indiana’s own Nate “Tobacco Road” Evans turned in a stunning 1972 double-sider and final release for the label. The 45 is best regarded for “Main Squeeze,” a triumphant mid-tempo number with uplifting horn stabs penned by Earl Randle prior to his work at Hi in Memphis. But it's Evans’ original work, “Pardon My Innocent Heart,” that's the real bottle-breaker. Dark and brooding, with backing by the Kitty Haywood singers, it's a perfect cap to Twinight's impressive five-year, 56-release gallop through the Chicago night.